Our Dining Card Plans offer you great savings and convenience. Plans are available on a monthly, semester, and annual basis. Dining Card values are used for purchases of food and beverage at the menu price. The values carry over and do not expire. Torino Monthly Dining Plan – Enroll and you will save $25 each month. Charges will automatically be posted to your credit card monthly. Your first month will be charged when you purchase the Plan. You can cancel your renewal at any time. Only $475 for a $500 value! Napoli “Semester” Dining Plans – This Dining Card Plan offers you an opportunity for greater savings of $125. You will only be charged one time for this Plan, at time of purchase. Only $1875 for a $2000 value! Milano “Semester” Dining Plans – This Dining Card Plan offers you an opportunity for greater savings of $200. You will only be charged one time for this Plan, at time of purchase. Only $2800 for a $3000 value! Roma “Annual” Dining Plan – Offers you the most savings of $450. This Plan is also a one-time charge at time of purchase. Only $5550 for a $6000 value! You can use your Central Kitchen Dining Card for online ordering through a web browser or on our FREE iPhone or Android app. BEFORE you use your Dining Card on our smartphone app or web page, you MUST register your card in your account on our online ordering web page using a web browser. YOU CANNOT ADD YOUR DINING CARD TO YOUR ACCOUNT USING THE APP. Once you add your Dining Card using your browser, it will then be available for you to use for payment whether you order online or use our smartphone app. Sign up for a new account, or sign in to your account if you already have one. Enter the first 19 digits of your card number (all the numbers before the dash) It will then be saved to your account to use for payment online or on our smartphone app! 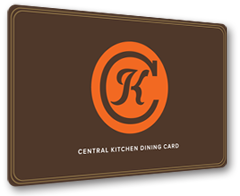 Why purchase a Dining Card Plan at Central Kitchen? Our Plans offer a great value. Unlike University Plans, our Dining Cards do not expire—any unused dollar amounts carry over. Bypass the local fast-food chains and enjoy convenient and wholesome dining at Central Kitchen exclusively at The Lorenzo. Parents have confidence that funds allocated towards Dining Cards are actually used for meals. Dining Cards encourage sensible eating—not “all you can eat”. You can add value to the card if it gets used up.